In the current post of our case studies we are really excited to to tell story story of our client http://scalemodelshop.co.uk/. I started Scale Model Shop in 2010 because I already had a established model forum which gave me a good customer base to get things off the ground. Working on it part time while also having a full time just I was able to give up my job at the end of 2012 to concentrate fully on my own site. I first started the shop using cscart which was ok but I soon found it wasn’t for me, I was introduced to Magento by a SEO company and liked it from the start as it seemed feature rich out of the box. Magento is not only feature rich but it is also resource hungry, and because of that I have thought about moving away from it, but with a bit of sever tweaking it does get better and I’ve yet to find another e-commence software that has so much going for it, in regards to add-ons and information found on the Internet to help if you get stuck. I found the support I have got to be good and reasonably priced add-ons, any problems I’ve had are fixed quickly. Firecheckout: It looks neat and tidy, works with other 3rd party addons I have installed and makes it easier for the customer to complete their sale. Know your market and good communication with your customers is vital, I send out emails during different stages of the order keeping them informed at ever stage, it put’s your customer at ease. As above, I used followup emails, these are automatically sent out to customers. Also follow up review emails, great way to get fresh content on your site, good for SEO. If you have an interest in scale modelling and would like to try out my site use promo code TM13 for an extra 10% off your first order. In case you are interested in posting your store about using our products then you can contact us at our contact form. This entry was posted in Case Study on July 31, 2013 by TemplatesMaster. Today we are glad to continue case study blog series and tell about great story of our client Muller Wenskaarten. Muller Wenskaarten, located in Almelo in The Netherlands started in 2007 with a small collection of greeting cards of own design. Our company has now grown and we carry more than 20 brands. Customers can select between 2.000 different cards. We also carry about 500 small gifts in stock for our customers to choose from. Delivery takes place by mail within 24 hours on weekdays. Back in 2007 we started with eCommerce. Most of our customers like to send a handwritten greeting card with a personal message. We concentrate on the Dutch language market. Not surprisingly most of our customers, consumers as well as businesses are situated in The Netherlands and Belgium. We started with oSCommerce and in 2010 we looked for an alternative. At that time Magento was the only alternative which was ahead of its time and had all the features we wanted. It is not the easiest platform in terms of setup and maintenance but once it is running it is easy to use. More important, customers can easily find what they are looking for. Bottom line: customer ease is what counts! We chose for Fashion template as it suits our company. It also has features which still are ahead of the game. Another very important reason for selecting Templates Master is their excellent support desk. Questions are answered within a day, sometimes within 30 minutes! Ajax Search is our favorite product. 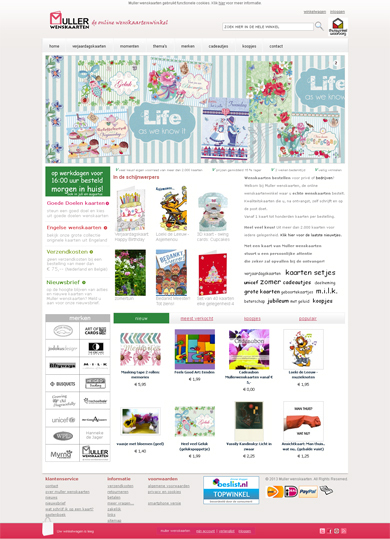 This enables our customers to search for and find the greeting card they like. For our customers the images popping up in the search screen is a major help. Starting with eCommerce is the same as starting a brick and mortar shop. Do not underestimate the effort needed to keep the shop alive. Magento helps a lot, but bear in mind that you will need to keep your shop up to date with new products and also make seasonal changes. The most important is, just like Templates Master, to have a fast support desk. Most of the extensions focus on front-end experience. I would like to bring an extension to your attention which makes life a lot easier. We use “extended product grid with editor" in the back-end. This enables easy changes of the stock levels and status of many of our products at once. It saves a lot of time! Templates Master customers can use coupon code TM042013 for a free magnetic bookmark with any order at Muller Wenskaarten. This entry was posted in Case Study on July 1, 2013 by TemplatesMaster. In recent 2 months our Argento theme has become really popular within our clients and the one of the first stores powered with Argento Moto center laba probably explain why it’s so popular. 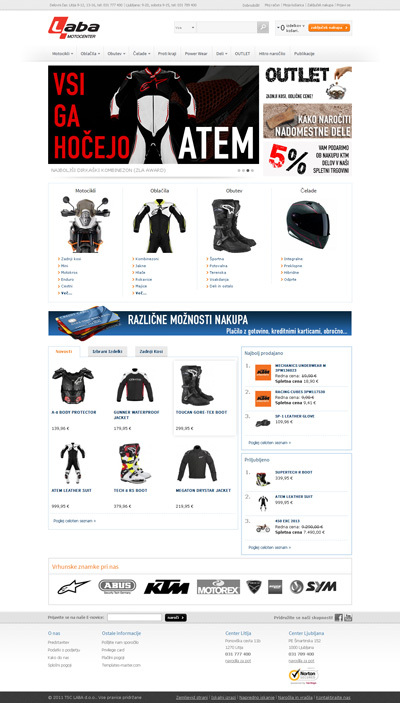 TSC Laba d.o.o., website represents a motorcycle division known under name Moto Center Laba situated in Ljubljana (BTC shopping area), capital of Slovenia,Europe. Our company was founded in 1997. It's a family company owned by two brothers (Bostjan and Simon). Our primary business was and still is annual vehicle inspections. Since 2005 we've opened a motorcycle store and became an exclusive importer of Alpinestars and Nexx gear. We also sell and repair KTM motorcycles. Our main goal is to become one of top three companies on the motorcycle market in Slovenia. We strongly believe in highest level of professionalism in doing our business. We are proud of our excellent customer support. We use ecommerce in our motorcycle division practically since day one. 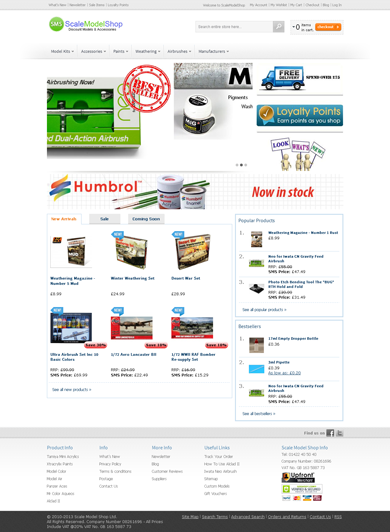 We've started with Joomla and Virtuemart and migrated to Magento in 2009. Ecommerce in our case does not generate that many sales because of the specific products we sell (one usually has to try before buying) but it is an excellent way for first communication with a customer and also a great support place. Magento was chosen because Virtuemart had too many bugs and not enough features. 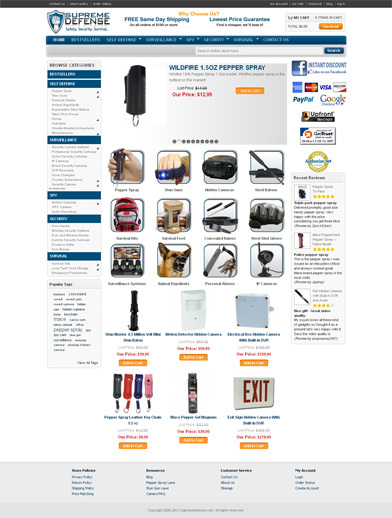 Magento is much more complex and more difficult to customize but when set properly, it offers and amazing experience. We have tried quite a few templates before Templates Master has crossed our path. But those templates were always unfinished with lack of features and compatibility with other Magento extensions. So far only templates from TM are really made to the last piece and usually it only takes a small tweak or two to make it perfect – in looks and function. Prior to today, we've used some templates, upgraded with Prolabels and Ajax Pro. Now we're all excited (so are customers) that we got our hands on Argento. Other templates from TM are great, but Argento with it's modules is just awesome. Easyslide/easybanner. So easy to add CMS contents and it immediately makes great effect on the frontpage. Magento community is free. But using only free extensions, templates etc. will never give you the e-commerce good enough for demanding visitors of your website. Unless you are a great programmer, choose your templates and extensions wisely and don't forget that you will need some support on those. Don't let few saved bucks turn your e-commerce into a nightmare – for you and your customers. We are using other extensions for product videos and custom stock status. We are certain that TM can make better ones. We have great offer on motorcycle brands we represent. For customers from EU we always make special deals. Just contact us at our store www.motocenterlaba.com. This entry was posted in Case Study on March 27, 2013 by TemplatesMaster. Today we are glad to continue our case study blog series with post about great company from New York Supreme Defense. Company started in 2006. Started with selling pepper spray. Have now expanded into a full line of self defense products, surveillance and spy cameras, and most recently survival gear. We have since grown into a thriving business with strict focus on customer service and a constantly growing inventory. In such a short time, we have helped thousands of people throughout the world protect themselves, their loved ones, and their property. I wasn't too familiar with ecommerce when I started this business. I had a website built for me by my wholesaler. I quickly learned how fun it was to sell online and work from home. Selling online grew our customer base from hundreds, to millions. We chose Magento because it was loaded with features, free, and the new kid on the block (at the time). I liked the fact that it was new because to me that meant the user community and support was on the rise, and not the downward spiral. Hot software is only hot software until something new comes along... then the community and developer support begins to dwindle. Magento has been great, and will be great for a long time. Why do I like Templates Master? I can go on and on with this one... We used a bunch of different extension and template companies in the beginning, but none come close to the support that we get from Templates Master. Template Master has been great to us. When I send a support email to Templates Master, i know i will get a response quickly and it will be a helpful response. In production sites support like this is critical. You will not find better extension support from any other magento developer. Period. Navigation Pro is my favorite extension because it gives me complete control over my navigation, which IMO is the most important part of any website. In order to sell, a customer has to find it. Not only is adding links easy, but adding a product block directly in the drop-down is priceless. My advice for beginners is obviously use magento, and use Template Masters extensions whenever possible. Every time I add a Templates Master extension my conversion rate rises. I would suggest a featured products extension. Something where you can pick which products to display on home page within its own interface and can be used anywhere by using block block code. With sliders, grid views...Currently using aheadworks Featured Products 3, but I know TM can do better than them. Templates Master customers can use coupon code TM10OFF for 10% any order at Supreme Defense. This entry was posted in Case Study on March 6, 2013 by TemplatesMaster. Today we are glad to start our first case study post series with post about great company from UK Sleepsoftly.co.uk. We are online retail company Sleepsoftly.co.uk located in the United Kingdom and selling via our website mainly bedroom furniture products such as bedsteads, bean bags, chair beds, divan bed bases, futons, mattresses. We are a family run business based in the South West, with over twenty five years experience within the mattress and foam cutting business based here in the UK... Our background originally lies in manufacturing, but we have been spreading our wings recently and have been expanding our customer base. Yes...we have traveled a winding pathway in our journey in ecommerce and are more than happy to help people avoid the pitfalls if it helps them achieve the outcome they seek easier. I think people will like it. Yes sure, if you live in UK then you can check our great promo with 90 x 190 mattresses. You can buy one and get one free with free postage at . Offer is valid until 5th of march 2013. You should add 2 to the cart to get the promo. This entry was posted in Case Study on February 10, 2013 by TemplatesMaster.